US, 1935, 85 minutes, Black and white. Joe E.Brown,Olivia de Havilland, Ruth Donnelly, Roscoe Carnes, William Frawley. Alibi Ike is as good as any film to be introduced to the comedian Joe E.Brown. Brown had a background in the circus, running away with parents' consent aged 10. He also appeared in vaudeville and began to appear in silent films. During the 1930s and the first half of the 1940s, he appeared in quite a number of films, small budget films as a vehicle for himself and his comic style, always making a great deal of his mouth, rather larger than usual! He also capitalised on this in the war-effort morale film, Hollywood Canteen. While he made a number of film and television appearances after 1945, he became famous for the final line of Billy Wilder's Some Like it Hot, "nobody's perfect". He was reputed to be one of the nice people of Hollywood. 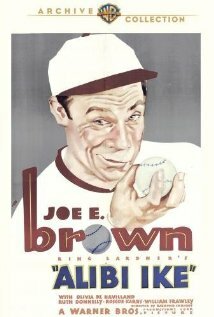 Brown was also considered a good sportsmen and this is taken advantage of in Alibi Ike, where he is a baseball player with a distinctive style of revving up for his pitch. He is employed for a failing team, plays in in demonstration matches, has some ups and downs in his career but always puts himself down with all kinds of explanations, spoken of as alibis, hence the title. The film indulges in verbal humour, written by well-known screenwriter Ring Lardner, one of the Hollywood 10, as well as some slapstick. It is quite a surprise to see Olivia to Havilland at the age of 19 in one of her earliest films, the same year as Captain Blood, playing an attractive young girl, a fan of Brown, but exasperated by his alibis.Ruth Donnelly appears as her more hard-boiled friend, fostering the romance. Character actor Roscoe Karns has some good moments as one of the team, continually prodding Brown and getting some of his alibis. And character actor William Frawley is the coach, not always persuaded that Brown is best for the team. The film was quite vivid in its presentation of baseball matches in the mid 1930s, the teams, the training, the coaches, the camaraderie, the rivalries, as well as the sports reporters, both on the radio and for the press. Perhaps it is bit of a stretch to have a romance between Joe E.Brown and Olivia de Havilland – but here it is.